New #car models, photos of new cars. 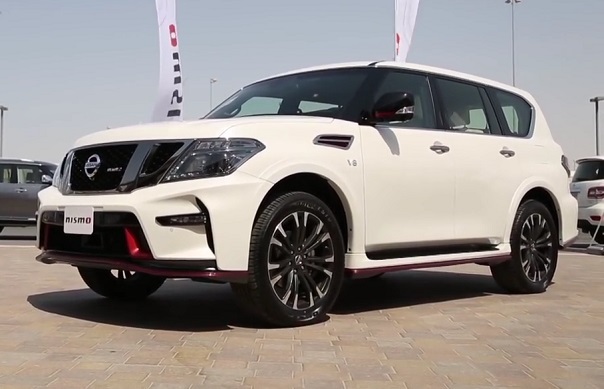 Powerful sporty SUV Nissan Patrol Nismo 2016-2017 model year from Nissan Motorsport presented in Dubai, and very soon will be available to motorists at first in the Middle East, and in the spring of 2016 new product gets to the United States. It does not exclude the possibility of the start of sales of the new powerful SUV Nissan Patrol INSM 2016-2017, and in Russia, at a cost of 4.8 mln. Rubles. 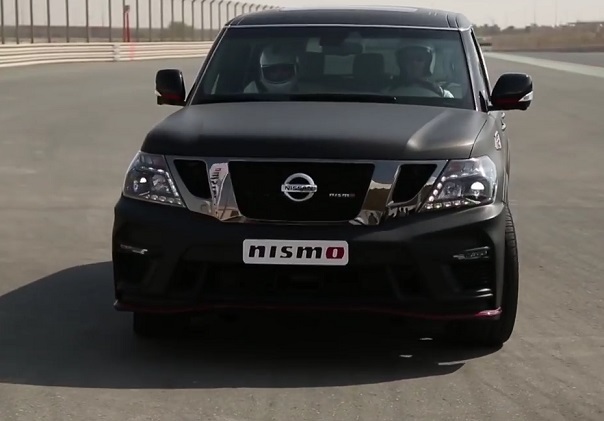 What is the difference between the new Nissan Patrol Nismo charged from an ordinary Nissan Patrol Y62? Official photos and video with images Nissan Patrol INSM pumped from Motorsport can detect changes in what is called in the details. Yes, and the information provided by the manufacturer in some detail reveals the revision made to the design of the body, interior and performance of a large SUV, with which the start and review trends. 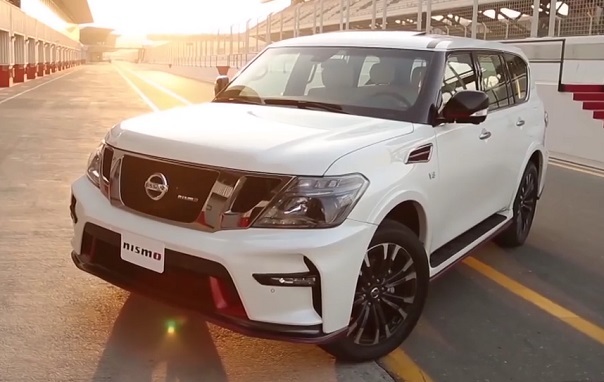 As we have seen under the hood of series Nissan Patrol mounted 5.6-liter V8 (405 hp 560 Nm), working together with 7 automatic transmission, providing a huge SUV weighing about 2800 kg dynamic acceleration to 100 kmh in just 6.6 seconds. In the engine compartment Nissan Patrol Nismo set a petrol 5,6 V8, but with an increased capacity of up to 434 horsepower and a slightly larger maximum torque of 580 Nm. 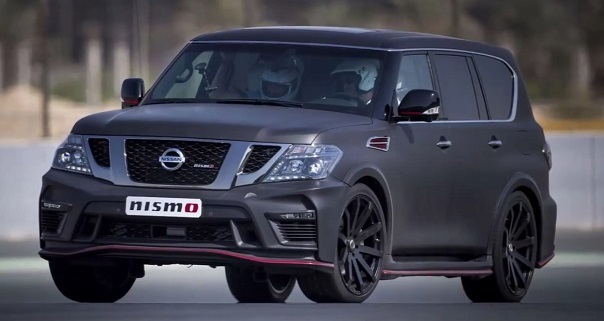 Whether improved dynamics and top speed pump over version Patrol Nismo compared to the civilian version of the SUV manufacturer, unfortunately, not yet reported. Just change the steering settings. The suspension came Bilstein shock absorbers, off-road car is equipped with forged 22-inch wheels with low profile tires. Body new giant SUV decorated with details of the aerodynamic package Zero-Lift, which provides not only a elegant look of the car, but that it is important to significantly increase downforce when driving the car at high speeds under 200 mph. Observing the front bumper with large air intake at the bottom center of the air duct and the vertical slits at the edges of the front fairing, organically complemented by horizontal bars LED strips, door sills and rear wheel arches, the original rear bumper with a diffuser and spoiler. The interior of the new Nissan Patrol Nismo 2016-2017, the luxurious, stylish and, of course, comfort. In the presence of the original instrument panel with red scale of the tachometer, chairs decorated with white skin, red trim and inscriptions the Nismo, color screens mounted in the headrests of the first row for passengers rear, decorative inserts made of wood on the front panel, center console and door cards. Well, needless to say, all inclusive equipment with a long list of equipment. Available premium BOSE audio system with 13 speakers Tew, light and rain sensor, three-zone climate control, power steering, electric front seats with heating and ventilation, heated rear seats, a sunroof and tailgate with electric drive, navigation system with 8- inch screen and cameras, providing a panoramic view, an entertainment complex with a DVD and two color screens for rear passengers, and plenty of electronic assistants: IBA (assistant under braking), ICC (intelligent cruise control), ESP (stability control), TPMS (control tire pressure), DCA (distance control by riding ahead of cars), LDP (control tiering movement) and LWD (assistant monitors the markup), BSW (blind Spot monitoring), HSA (assistant at the start of the hill) and HDC (downhill from the mountain), FCW (warning system about the threat of a frontal collision).